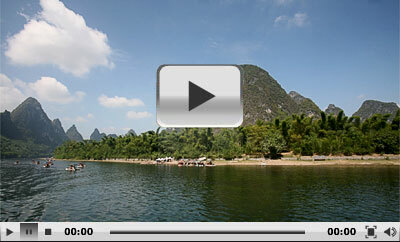 Where to start a Li River cruise? The trip starts from the wharf south of Liberation Bridge in Guilin downtown area. Otherwise some agencies will transport tourists to take a one-hour bus ride to the Bamboo River Wharf (Zhujiang Wharf) or the Millstone Hill Wharf (Mopanshan Wharf) to start the cruise from its essential part. English-speaking tour guides are only available on the cruises which depart from Zhujiang Wharf, so foreigners are suggested to leave from the wharf for their convenience. All tourists taking a Li River cruise are required to show passports when booking ship tickets and boarding. They need to get to the wharf at least 30 minutes before departure to leave enough time for passport inspection. Those who can't provide valid passports should go to the police station near Zhujiang Wharf to ask for a temporary ID proof 30 minutes before departure. The Li River cruise is over 52 miles (83 kilometers) long and is estimated to take four to five hours. The eye-feasting landscape and country scenery will never disappoint you. The river generally has three sections. Various attractions like peaks and villages along the river have interesting descriptive names, which calls for much of your imagination to see what it is like. Listening to tour guide's legendary stories about the attractions is a delightful experience when you are appreciating the landscapes. Most are mystical fairy and love stories. The following introduction to the attractions are presented in order of the attractions' locations along the river. You can refer to the map of the river course. Now start our impressive river trip from section to section! In the first section, which is from Guilin to Ox Gorge, you can enjoy the following scenery: Elephant Trunk Hill, Chuanshan Park, Daxu Ancient Town, and Ox Gorge. Situated majestically on the western bank of the Li River, the hill resembles an elephant sucking water from the river with its long trunk. It is supposed to be the landmark of Guilin landscape, which you can find on travel brochures or books. The most impressive is said to be the water reflection of a moon-like cave when the moonlight sprinkles over the river, hence the name 'Moon over the Water'. A few minutes down from the Elephant Hill, it is an idyllic park on the eastern bank of the river. The park is famous for its graceful natural scenery, with attractive spots like the Cockfighting Hills (formed by Chuanshan Hill and Pheasant Hill), Pagoda Hill, Moon Cave, and Chuanshan Hill Cave. Perching on the northern bank of the Li River, the ancient town keeps in its antique style from the Ming Dynasty (1368-1644). A flagging street, lined with old residences, shops and stalls, runs two kilometers along the river bank through the town. Some well-preserved residences hidden behind the street door may give you surprises you when you occasionally explore further into a shop. These are quarters for businessmen in the past times. Have a try on various dumping snacks on the stalls or peddle cars along the street. Some will surprise you with both its taste and cheap price. People in the town are very kind to tourists. Further to south, there is a single-arched bridge in the town named Longevity Bridge. The town is really a sight off-the-beaten track. Opposite the town on the other side of the river, a millstone-like rock with the running waters creates the scene of Grinding Grain. In the second section, which is from Ox Gorge (near the Bamboo River Wharf and the Millstone Wharf) to Water-Dropping Village, the most charming scenery of the cruise awaiting you include: Wangfu Rock (Yearning-for-Husband's-Return Rock), Crown Cave, Half-Side Ferry, Yangdi Village, Mural Hill, Xianggong Mountain, Yellow Cloth Shoal, and Xingping Town. A crown-like crag earns the hill its name. What makes the hill a worthy stop for both cruise tourists and those arrive from Guilin City by bus tour is its twelve kilometer long water-eroded cave. It is a wonderland of various stalactite, stone pillars and rock formations in the cave. Since it is open to tourists in 1995, illuminating lights, sound control tour guide system and escalators are equipped in the scenic area and sightseeing cars and boats enable visitors to tour inside the cave. The government plan to build this site as an all-round tourist area including cave visiting, country sightseeing and ethnic minority exploration. It is estimated to become an important excursion site along the the river. Tourists can stay in the hotels and villas in the scenic area. Also known as Xianggong Hill, Xianggong Mountain is the best spot to take a distant view picture of Li River. At the top of the mountain, you will find yourself in a wonderland composed of a sea of clouds, sunrise and rosy sunglows. Boating downstream southward from the Mural Hill about 500 meters, peaks become steep and the river become wide and quiet. A huge yellow flagstone lying under the limpid waters can easily be seen. It is like a cloth piece and people called it Yellow Cloth Shoal. There are seven green peaks standing nearby. A legend goes that the seven peaks are fairy girls from the heaven who took baths in the river. Enthralled by the charming scene, they stayed here and become into the peaks. With verdant bamboos, the green peaks under the blue sky reflected on the quiet waters create a spectacular scene. Sometimes, people doubt they see boats floating on hill tops. Many Chinese paintings and poems present this charming scene and tourists run out of their films for it. Li River takes a big turn at Xingping and endowed with beautiful and poetic scenery. It has been reproduced in many Chinese landscape paintings. Even the newly-issued 20 RMB note has the scenery on its back. A photographer once said: 'Shots from any perspective for this place turn to be impressive and stunning'. It is a good choice to climb Laozhai Mountain nearby. When you stand on the top, you can have a bird's eye view of Li River like a jade belt flowing through the hills. A 'village' on the river bank is worthy a visit. Chinese call it a 'village' because of the fact that nowadays it is inhabited by villagers. Actually, it is an age-old castle complex survived from over 500 years ago. Although some courtyard buildings have weathered through ages, the simple but elegant flying-eaves, roofs with colorful paintings, lattice windows and unique timber structures present the folk residence from the Ming and Qing Dynasties. The villagers have the same surname of Zhao, so it is rumored that they are descendents of the imperial family in the Song Dynasty. Both Dr. Sun Yet-sun, the pioneer of China's democratic revolution and US president Colinton paid a visit to the village on their visits to the river. The third section goes from Water-Dropping Village to Yangshuo where you can see Snail Hill, Green Lotus Peak (Bilian Peak), and Shutong Hill (Schoolboy Hill). The scenery is equally beautiful. The cruise makes the small town known to foreigners. The town is very small that everyone will know you after one month. Located some 90 kilometers south of Guilin City, this town is the downstream end of the cruise but not the least. The enchanting fairyland of Yangshuo is renowned as the best in Guilin. When the cruise ends in Yangshuo, tourists will disembark at the Shuidongmen Wharf near the Green Lotus Peak or Fu'an Wharf near the Shutong Hill. Walking to the famous West Street is a great choice if you disembark from the Shuidongmen Wharf. The West Street lined with western cafes, restaurants and hotels is a wonderful place for people who want to explore Chinese life. Yangshuo is a great place for hikes and cycling excursions. There's no doubt that taking a close-up exploration to the country villages, you will have a taste of the rural life. One thing surprised us is the one-hour bamboo raft trip along Yulong River. We didn't expect the scenery to be such a paradise. When is best time to visit Guilin? Generally speaking, April to September is the best time to visit. Is it easy to transport luggage from taxi or coach onto the River Li cruise boats? Yes, it is easy. The staff will help you. Can I bring along my luggage to board the Li River cruise ? If I check out of my hotel in Guilin and board the Li River cruise, can I bring along my luggage to board the cruise ? As I will be staying in Yangshuo at the end of my Li River cruise. Yes, you can bring your luggage to board the cruise. Don't worry. Transport back from Yangshuo to Guilin? Is there any possible transfer for individual travelers from Yangshuo back to GL after the Li river cruise? Yes, it is possible. You can take the bus No.602 or take a taxi from the Yangshuo pier to the Bus Station. At Yangshuo Bus Station, a lot of buses to Guilin are available from 06:45 to 20:30 every day .